Sorry no blog yesterday… it was…. a day. 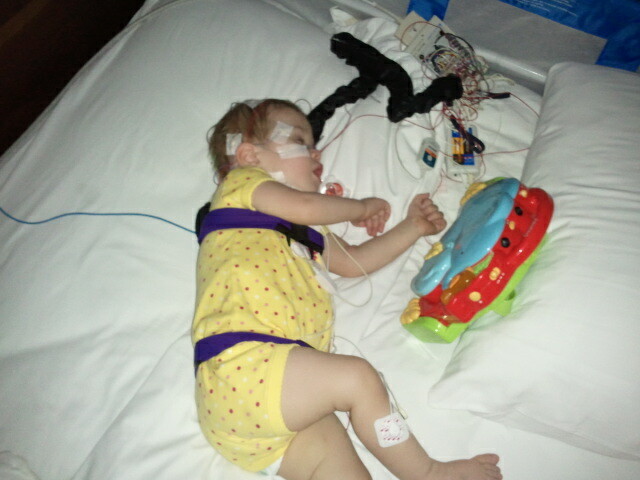 Tuesday night, Annabelle finally got her sleep study. We’ve known since February that she needed it, but the soonest they could schedule her was April. In January, we did an at-home pulse-ox study because she’d been consistently dropping her oxygen saturations at night only, and we couldn’t figure out why. It wasn’t all night, she’d dip and come right back up. But the pulse-ox study recorded her sat’s all night, and showed that she was too low for far too much time. The pulmonologist told us we needed to keep her on oxygen at night until we could get a sleep study done, which would show us more about possible reasons for the dip in oxygen, and tell us exactly how much she “needs” in order to maintain a good O2 sat. We followed directions for a while. But February was bad, because that’s when she had RSV, and ended up being on oxygen 100% of the day for a long time. But in March, she recovered like crazy, actually BETTER than before. She no longer dipped at night, and eventually I stopped putting it on her at night, because she was doing so good. The doctor, however, wasn’t convinced that she had made such a fabulous rebound, and still wanted the sleep study. First, they don’t sleep in a crib. They put her on a full-sized bed (the sleep center is actually in a hotel in downtown Nashville.) So I slept with her, with a child rail on the other side. Second… to annabelle’s horror, they used goop and tape to attach little probes all over her head, her temples, her chin and her neck. They also put two on her chest and two on her legs. Then they put a belt around her chest and another around her waist. They topped it off with a pulseox probe on her toe, which was the one thing she was used to! After they had hooked her up, she was screaming so uncontrollably that she collapsed her probed head against me and just closed her eyes. And proceeded to sleep deeply ALL night. The tech said in the morning that they got a great study on her, and usually they ahve to redo them 2 or 3 times. Uh, yeah, that experience would NOT have been repeated regardless of the status of the study! Not until she was old enough to not think Mommy was putting her in the electric chair or something. I’ve never seen her look at me with such absolute ‘What are you letting them do to me??? ?’ before. Broke my heart! Needless to say, Mommy got little to no sleep that night. And the tech came in at 5:45 A.FREAKING.M. to take off her leads and wake her up. Annabelle was just as displeased at that as Momma was. To top it off, she had feeding therapy scheduled for 1 that day, and I didn’t want to drive the almost hour back home, then drive all the way back later in the day. So Annabelle and I were operation “kill time” in Nashville. Needless to say, by the time we got home, it had been a very. long. day. And Annabelle proceeded to pass out (i.e. fall asleep on a whim) on the living room floor about 5:30 p.m.
And of course, after I got her to bed, she woke up at about 11 p.m. playing in her crib. Not sure when she fell back asleep… but she woke up again at 5 a.m.
*big sigh* Praying we can get our schedule back!!! I need my good night sleeper back ASAP! We don’t know official results from the sleep study. We meet with the pulmonologist in May to get the official results, as they said it takes a few weeks to get the official results sometimes. I took that as a VERY good sign. That, and they said if she needed oxygen, they would come in and put it on her, and they never did. So here is to hoping we are officially “cleared” of our need for supplemental oxygen! I really wanted to get her on “tape” doing this to announce it. But alas, it is not simple to video tape!! 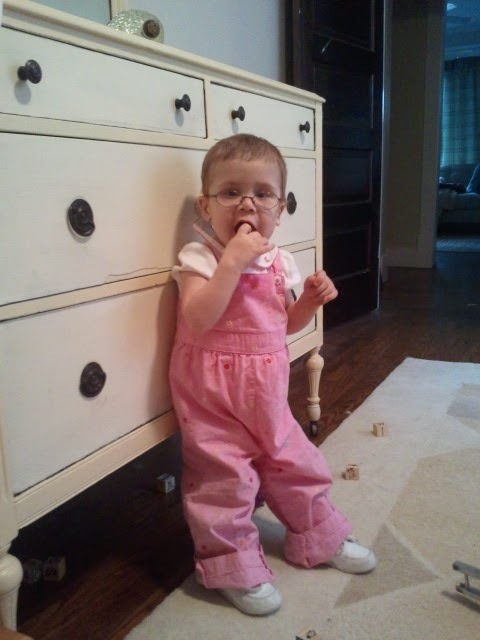 Annabelle is trying her hand (er, I guess more aptly, her legs) at standing. Like letting go and standing all by herself. 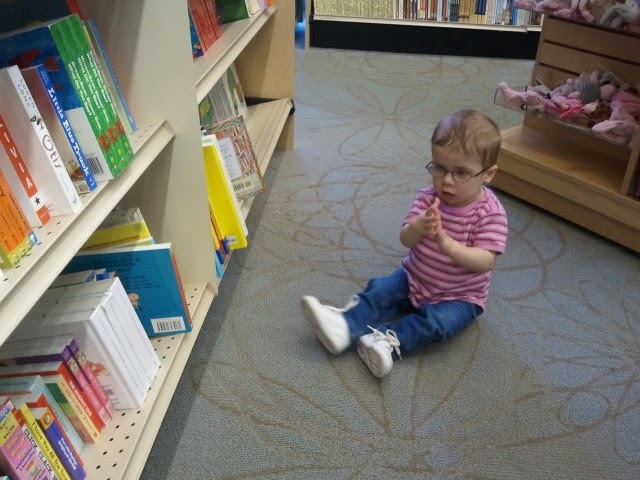 She’s clocked up to 6 seconds at a time of letting go and standing unassisted. She’ll let go and clap her hands, or even let go to reach for another surface. This is SUPER SUPER SUPER big news… as it is the next step before WALKING! She’s getting a little more sturdy on her legs when we walk with her holding my hand, although there’s still a bit more wobbly. Our PT is “out” next week… and the week after that we have scheduled to get fitted for braces on that Thursday, two weeks from today. Unless, of course, she decides to walk before then. A Mom can hope right?!? 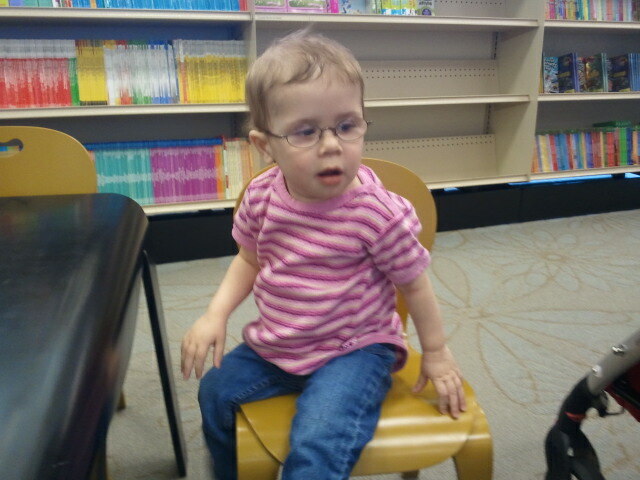 She had her eye doctor appointment on Monday. SUPER good news there. Her eyes are doing exactly what they want them to do! We don’t go back until JANUARY! WOOHOO for that!!! And… while they still want me to patch when I can, the “rules” are relaxed, where I just need to do for a few hours when we are able, vs a daily thing. We had her GI appointment on Tuesday. Good and bad news. Their assumption is that it is from long-term poor nutrition that has worn them down, which could contribute to her abnormal stool, and as she grows stronger and gets food in her gut, they should correct themselves. It also could be the high caloric density of her formula, but we NEED her to continue to gain weight, which she is, slowly but surely, so we are keeping steady for now. So, the bad news is there really isn’t else we can do. We keep the track, try to get her to learn how to eat regular food. We have a “nutrition clinic” scheduled for August, but she said I could feel free to cancel it, as the main thing they will do is weigh her. And since she gets weighed and cardiology (and will get weighed at her 24 month ped visit in July) I doubt we will keep the appointment. Okay, I think this is all. Sorry again for the long, rambling update. Oh, and since I won’t be blogging on Friday for Skinny Friday… (since it’s already Thursday night…) I’ll just say this. Yeah, I failed this week. Having been gone from Tuesday afternoon through Wednesday afternoon and surviving on fastfood while away from home and extreme amounts of Coke to stay awake since then…. uh, yeah. You couldn’t pay me to step on the scale today. Getting ready for sleep study… but mommy I don’t wanna!!!! I can’t get them off… so I might as well sleep. This stinks! 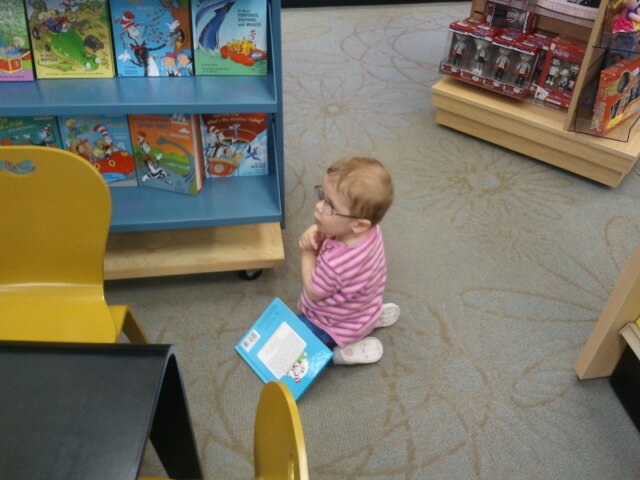 Yeah for bookstores and being a big girl sitting! Rubbing her hands together… which one, which one, which one, so many choices! 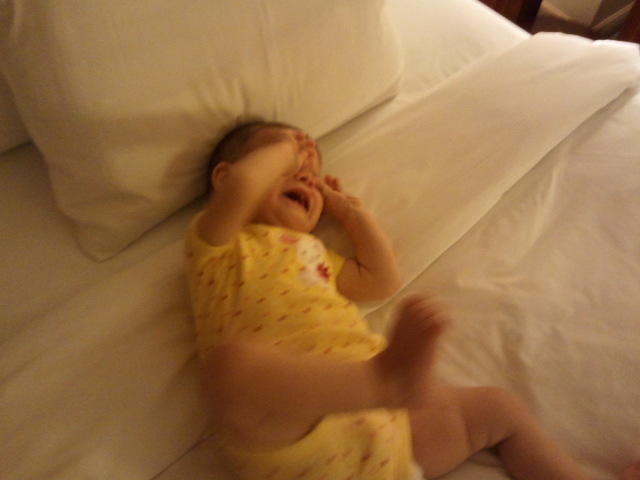 I like Cousin Baby Pamela’s room! 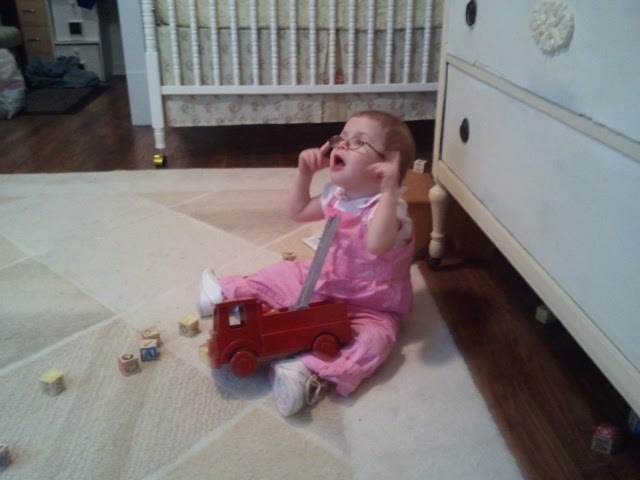 She’ll be out of Aunt Kari’s tummy right before MY birthday… so I thought I’d break in her toys for her! Yeah for red fire trucks and blocks!!!! She's adorable, and she's getting so tall! What a big girl! Rejoicing with you over the good news. So sorry you had to endure the sleep study. Praying you continue to move forward in wonderful ways. Thanks for sharing the update and details on her sleep study. As Karen mentioned, she is really going to town on the height. I'm so glad her sats were great that night. Amazing how she just seemed to improve after such a tough health period.